By Tim Royner: Promoter Frank Warren revealed that Saul Canelo Alvarez and Chris Eubank Jr. wanted no part of facing Billy Joe Saunders, who is moving up to super middleweight to broaden his horizons to go after all the belt holders in that division. After winning the WBO middleweight title in 2015, Saunders (27-0, 13 KOs) found out the hard way that the top guys at 160, Gennady Golovkin and Canelo Alvarez, weren’t beating down his door to make a fight with him. 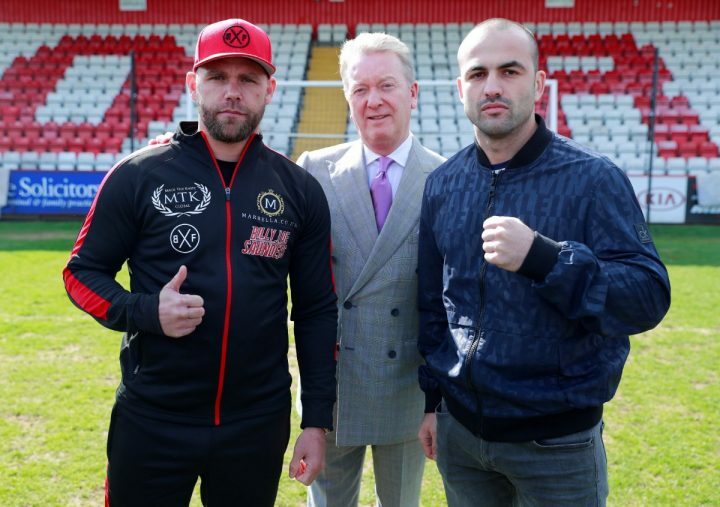 Saunders held onto his WBO title for three years before vacating, and is now moving up to super middleweight to face Shefat Isufi (27-3-2, 20 KOs) on May 18 for the interim World Boxing Organization super middleweight title at the Lamex Stadium, in Stevenage. That title could become the full WBO 168 lb belt if current champion Gilberto ‘Zurdo’ Ramirez chooses to stay at light heavyweight after he faces Tommy Karpency next month on April 12 at the Staples Center in Los Angeles, California. If Ramirez chooses to keep his WBO title, then he’s going to have to face the winner of the Saunders-Isufi fight. Saunders dominated Eubank Jr. in beating him in 2014 by a 12 round split decision. Eubank Jr. chose not to push for the rematch after all these years, and he’s now fighting at super middleweight. Saunders moving up in weight to super middleweight should make it easier for him to fight a rematch with Eubank Jr., but the fight still might not be doable. “When I was at middleweight and I was a champion, I think my style was all wrong for certain fighters,” Saunders said in dropping a hint about why he was never able to get fights with Canelo and Golovkin. “So we’re going to have a go at super middleweight. I think people are waiting for me to get a little bit older when my reflexes aren’t as good anymore. What they don’t realize is I’m in my prime now at 29. I’ve not got miles on the clock. I’ve fought 27 fights. If I took 10 good punches, I suppose that’s a lot, and I’ve been in with some good opponents. I’ve just settled into my prime now. I’m going to show people what I’ve got this year. If they don’t want to fight me this year, then I’ll just beat whoever they put in front of me,” Saunders said. The guy that Saunders needs to go after at super middleweight is WBA champion Callum Smith. That would be a good fight for Saunders. If he can beat Smith, he would receive a massive amount of respect from the boxing world, because he’s considered the best fighter at super middleweight right now. Another guy Saunders should target is former WBC super middleweight champion David Benavidez, if he beats Anthony Dirrell. Benavidez, 22, is a guy that could wind up ruling the 168 lb division in the near future. Benavidez is young, heavy-handed, and he has the size at 6’1 1/2″ to give a lot of guys problems, including Saunders. Saunders left no question that he was the better fighter in beating Eubank Jr. in 2014. However, Eubank Jr. has improved a lot, and he’s a much better fighter now than he was five years ago when he lost to Saunders by a 12 round decision. “I’m open to any super middleweight or middleweight fights in the world,” Saunders said.